June 30, 2017. Meet Lemony! I adopted her a few months ago, and she is settling in well. Lemony is around 8 years old, and i believe that she is a pug-terrier mix. She was fostered, and given substantial medical treatment, by a small but heroic local rescue called Comp-Animals. The Lemon has a few training kinks we need to work on, including the tendency to be protective while on a leash, but we’re off to a good start. I look forward to some good years together. It is with great sorrow that I share the death of Teddy, Stump’s friend, on 22 March 2017. Teddy had been growing increasingly frail. I adopted him 3 1/2 years ago from a senior-dog rescue, and I’m glad that I was able to give him a good old age. Here is “selfie” of us from January. Missing all his teeth never stopped him from expressing his views on the world with confidence that he would be listened to. He was intrepid and cuddly, a really great combination in a small dog. He loved Stumpy, and he also loved the little dog I adopted a few weeks after Stump’s death because Teddy was so clearly lonely. I’ll introduce Lemony to you separately. I miss Teddy every day. Stump passed away on Friday 30 December at 11 a.m. My veterinarian and her assistant were very gentle and kind with him at the end, and I stayed with him until his heart stopped beating. Stump had been suffering from dementia as well as arthritis, and it was the cognitive impairment that led to my decision to let him go. He no longer recognized anyone, although he was still comfortable with me, and he was afraid all the time since he lived in a world of strangers and unexpected noises and events. Stump was a great little fellow, with a huge heart and a lot of attitude, and I tried to give him a happy life since he had apparently had a pretty difficult time in the past. Until I adopted Stump and Teddy, I had never had such small dogs. Here is Stump in 2014, commandeering a lookout point that had been dominated by cats for many years. Here are Teddy and Stump in a photo taken soon after I adopted them both in 2013. Ted still had a few teeth at that point. My vet determined that they were unsalvageable, so now he is a gummer who gets along quite well without them. Meet Sidney. He’s an African tortoise, and I’ve had him since 2006, when he was a tiny hatchling. He was born in southern Delaware, and I purchased him in a small pet store in Kent County that no longer exists. I should have asked for the name of the breeder, since I do not have a clue h ow large he is going to get. I have been told that he will get very large, but he weighs about 12 pounds right now. Sid is a very pleasant fellow. He likes to have the top of his head stroked and comes when he hears my voice. I swear that he knows that the refrigerator is the place where the vegetables are stored. His favorite treat is peapods, and he LOVES fresh figs and peaches, although too much of them can have an unfortunate effect on his insides. Sid sleeps under a bookcase or the kitchen butcher block island in the winter and has both indoor and outdoor pens in the warm months. If he continues to thrive, he will outlive me, so I’m going to have to plan for him in my will. 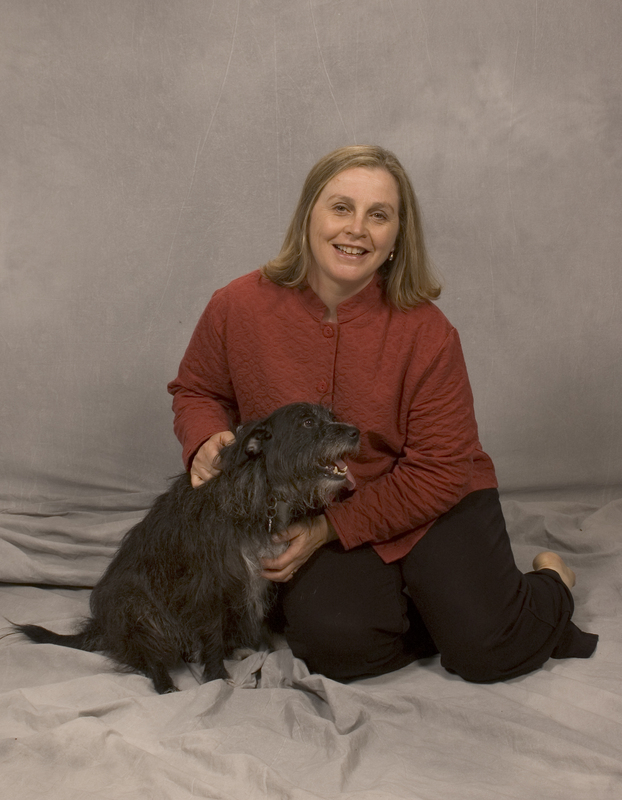 This is a studio portrait of Patti and me taken in the summer of 2006. Patti died in September 2013 of congestive heart failure; she was 14 years old. The circumstance of this double portrait was a professional shoot for the cover of Pets in America. I wanted to put Patti on a tabletop or in a chair (as in a Victorian pet portrait) and she was having none of THAT. She went limp and kept oozing off the table! I wound up taking my shoes off and getting down on the floor with her. Patti always had a way of working things out to her satisfaction. I still miss her every day. This summer (2014), Sidney spent a lot of quality time in his pen on some lush grass near the back door. 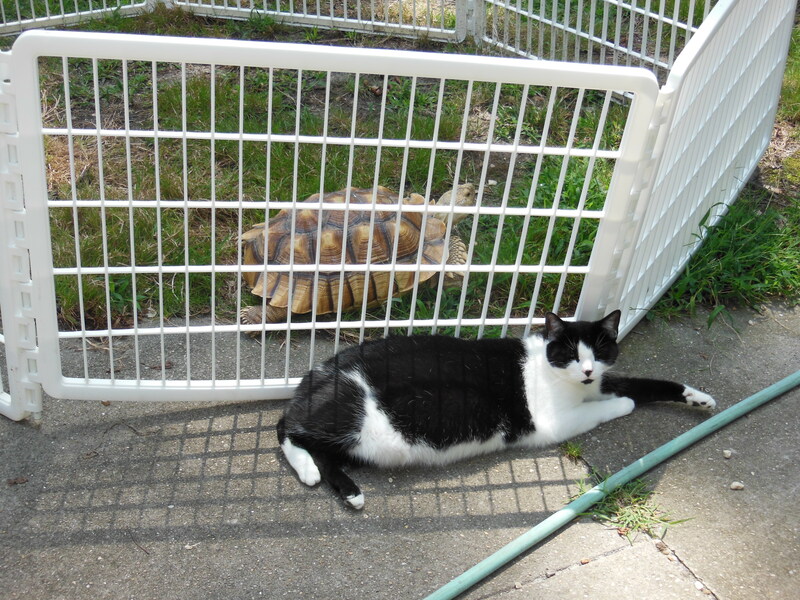 Ruby decided that she liked hanging out with him, and they often lay in the sun together on either side of the fence. I rescued Ruby from a barn where I kept no horse Sipper. Someone dumped her, and when she turned up in my tack locker, it was clear that she was not a barn cat. We have had her for five years now. When I saw this video of a playful turtle, I thought of you and Sid. I had no idea that a turtle could play.